Harrison Peters remembers the 10-grade teacher who said he was not college material, and the one who said, I love you, I believe in you and I refuse to allow you to fail; What we tell our children, absolutely matters. Harrison grew up in Pensacola, FL. He was raised by his grandmother who only had a 2nd grade education. As result he was completely dependent upon caring teachers to help him reach his academic potential. That’s why, for nearly two decades, Harrison has been fighting for children across the country. He began his career as a 4th and 5th grade teacher in Apopka, FL. 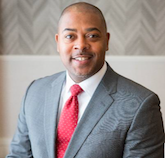 Since the classroom, he has served in many leadership roles as Dean of Students, Assistant Principal, Principal, Assistant Superintendent and Deputy Superintendent. His work in large complex school districts like Charlotte Mecklenburg, Chicago Public and Houston Independent have afforded him the opportunities and challenges of transforming some of the toughest schools in the country. As Chief of Schools on the Southside of Chicago, Harrison is credited with significantly increasing ACT scores, 3rd grade reading, math proficiency, and graduation rates. As a Chief School Officer in Houston, he was part of the leadership team that led a majority vote in favor of a $1.9 billion bond, the largest in the history of the state. While in Houston, he was also awarded the “Outstanding Educator” award by Zeta Tau Lambda. A proud Veteran of the United States Navy, Harrison was assigned to the USS Cleveland. Currently, Harrison serves as Deputy Superintendent-Chief of Schools, for Hillsborough County Schools. He is responsible for the day-to-day operations of the district’s 250 schools that educate 212,000 students. His team of eight area superintendents, 850 administrators and 17,000 teachers, has achieved record breaking graduation rates, industry certifications, college scholarships, and significant reduction in the student achievement gap. Harrison completed his Bachelor’s Degree from the University of West Florida in Elementary Education. He earned his Master’s Degree in Education Leadership at Nova South Eastern University. Harrison and his wife Tarneisha have two sons Devin and Kenneth. With student success as his “north star,” Harrison is convinced that within every child lies an endless potential that, given the right conditions, can produce extraordinary results. He holds a B.S. in computer science and mathematics from Furman University.